The following materials are from SOUTHEAST DOCUMENTATIONS and have been translated from the Spanish, Las Advocaciones Marianas en la Religiosidad Popular Latinoamericana. "Allow us, O Mary, to take part in your pilgrimage through the countries of Central and South America, where you are so well known and loved from Guadalupe in Mexico, to Aparecida in Brazil, to Caridad del Cobre in Cuba; from Coromoto in Venezuela, to Copacabana in Bolivia, and in many other places...."
"Mary, be a pilgrim with us on the paths of the world...."
John Paul II, "Prayer to the Immaculate" in Rome's Piazza di Spagna on December 8, 1993. Popular piety has woven a chain of tenderness and devotion that connects all Latin America in a constant pilgrimage to the Marian shrines. These great centers of worship have an enormous power of convocation and contain a treasure of faith in the images of Mary which the people venerate with a deep love tied closely to their national identity. The histories and legends that have arisen around these images are born of the sorrows and the hopes of our Latin-American people. This is the reason why the feast and worship that the Church dedicates to them have become the axis of popular evangelization. These devotions provide the faithful with a profound religious experience whose true value has yet to be recognized. This issue of "Southeast Documentations" tries to be a quick pilgrimage guide with brief pieces of information regarding the principal titles of Mary in Latin America; a sort of small basic manual to become acquainted with the numerous sacred images with which our people express their profound Marian roots. Portraits wonderously painted, discovered or renovated; clay, wood or stone figures; rescued from river bottoms or carved to acknowledge a favor obtained or in remembrance of deliverance from danger; white, dark-skinned, mestizo, mulatto, Indian. These deeply-loved Marian representations are a strong element in belonging to the Catholic faith and in the identity of the emigrants who, far from their native land, find their roots again in the devotion and worship of the patroness of their country and of the image which represents her. The origins of all these devotions have something in common: their popular character. The discoveries and apparitions always happen among the simple and humble: Indians, mestizos, the poor; people whose hearts are open to God. The Virgin of Luján is a small - two feet high - terracotta fiqure of the Immaculate. It was made in Brazil and sent to Argentina in May, 1630. Its original appearance seemed inspired by Murillo's Immaculates, but in 1887, in order to detain its decay, the image was given a solid silver covering, and is usually clothed with a rich white robe and a sky blue cloak - these being the colors of the Argentine flag. Only the dark oval face with big blue eyes and the hands folded in prayer are now visible. Tradition has it that the ox-drawn wagon taking the statuette from Buenos Aires to Santiago del Estero stopped inexplicably by the Luján river, near the home of Don Rosendo Oramas. The oxen were changed and the wagon was unloaded, but to no avail, the oxen refused to cross the river. Then someone noticed two small boxes that had been left in the back of the wagon. Each of these boxes contained a different image of the Virgin: one represented the Immaculate and the other the Virgin holding the Child Jesus. First they unloaded this image and nothing happened, but when they removed the box that contained the Immaculate, the oxen got going immediately. The astonished witnesses repeated this several times with the same result. They then understood that Our Lady wished to stay in Luján and they obliged her. At first the image was taken to the home of Don Rosendo who built a primitive chapel for it, where Our Lady was venerated for forty years. A bigger and more beautiful shrine was completed in 1685 and the final sanctuary was built in the XIX century. The image was crowned canonically in 1887 and in 1930 Pius XII gave the sanctuary the title of Basilica. Where it is part of Bolivia, the peninsula of Copacabana penetrates Lake Titicaca near the islands of the Sun and Moon, sacred sites of the Incas. It is here, at 4800 meters above sea level, that devotion to the "Most Blessed Virgin de la Candelaria, Our Lady of Copacabana," originated. The figure, made of plaster and fiber from the maguey tree, is completely covered with gold leaf, except for the face and hands; the garments reproduce the colors and dress of an Inca princess. The original shape is permanently hidden by rich robes and cloaks, and the carved hair has been covered by a wig. The image of the Virgin measures over four feet, and her soft expression - and that of the Child she holds as if it were about to fall - recall the features of the inhabitants of the region. The statue is the work of Francisco Tito Yupanqui, a descendant of the Inca Huayna Capac. The first efforts of this inexperienced sculptor were rejected, but finally his love and perseverance produced this image of the Virgin which was humbly enthroned in a poor adobe church on February 21 1583, making it one of the oldest Marian sanctuaries in the Americas. The present temple dates from 1805, and the image was crowned during Pius XI's pontificate. Over the centuries the image was showered with valuable jewels and the church with treasures which were later looted by presidents, dictators and generals. Presently the image, which the quechua and aimara Indians call La Coyeta, has rich jewels on her neck, hands and ears, the gifts of her devotees. 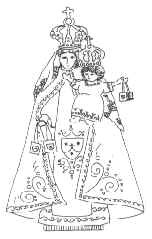 In her right hand she holds a straw basket and a baton, the gift and souvenir of the visit of the viceroy of Peru in 1669. The original image never leaves the sanctuary, which became a basilica in 1949; a copy is used for processions. At first the feast of the beloved patroness was celebrated on February 2, [formerly] the Purification of Mary, and later it was transferred to August 5 with its own liturgy and great popular celebration. In October of 1717, Dom Pedro de Almedida, Count of Assumar, was on his way to the state of Minas Gerais from Sao Paulo. He would have to pass by Guarantinqueta, a small city in the Paraiba River valley. The people of Guarantinqueta decided to hold a great feast to honor the Count, and a lot of fish would be needed. However, it was not the season for fish and the water seemed deserted. After many hours of catching nothing, the fishermen were very depressed. Among the fishermen were three men who always prayed to Our Lady of the Immaculate Conception -- Domingos Garcia, Joco Alves, and Felipe Pedroso. Before going out to fish, they asked God to help then in this difficult task, to find enough fish at this time when no fish were available. Felipe knelt and prayed, along with his companions, "Mother of God and our Mother, we need to find fish!" Just before they were ready to give up, Joco cast his net one more time near the Port of Itaguagu in hopes that they would find fish. However, they found a body of a statue! Joco called out in surprise, "Domingo! Felipe! Come and see what we have!" They cast the net one more time and brought up the head of the statue! They very carefully washed the statue and saw that it was Our Lady of the Immaculate Conception. They wrapped her in some cloths and continued to fish. Domingo commented, "We worked all night and have found no fish!" Felipe had a proposition: "Let's continue to fish with faith in the Virgin Aparecida (who appeared)." From this moment on, the net became very full with fish. This was the first miracle of Our Lady of Aparecida. It is not known how the small (less than three feet high) statue came to rest at the bottom of the river, but its artist is known, Frei Agostino de Jesus, a "carioca'' monk from Sao Paulo who created artistic clay sculptures.The image was made around 1650 and must have stayed submerged in the river for many years because it lost its original polychromy. The image is now a brilliant dark brown color, and is covered by a stiff mantle of richly embroidered thick cloth, allowing only her face and hands to be seen. She wears on her head the imperial crown with precious stones with which she was crowned in 1904. In 1930 Pope Pius XII proclaimed her principal patroness of Brazil. Her feast on October 12 is a national holiday. Pope John Paul II visited the Virgin "Aparecida" in her much frequented sanctuary and gave it the title of Basilica. A few days before the visit someone got hold of the statue and threw it forcibly on the floor. Although the frail image was broken into many pieces, the loving and careful work of several artists put it together again and the Virgin, "Aparecida" returned to her niche in the Basilica. 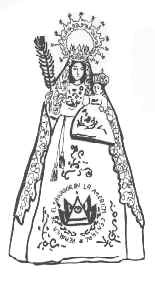 In the year 1785 Don Martin de Lecuna ordered an image of Our Lady of Carmel from a sculptor in Quito, whose worship and devotion have since been associated with the struggles for independence of the Chilean nation. On December 5, 1811, Generals José Miguel Carrera and Bernardo O'Higgins asked the Vicar of Santiago de Chile for a "Solemn Mass of Thanksgiving" for success in the struggle for independence. On January 5, 1817, General José de San Martin placed his baton in the right hand of the image and solemnly named her Patroness of the Army of the Andes. On the eve of the battle of Chabuco, the army, led by O'Higgins proclaimed the Virgn of Carmel patroness and general of the Chilean armed forces. In 1818, as the Spanish forces were advancing, the people and their leaders crowded into the cathedral to place their prayers and trust at Our Lady's feet. 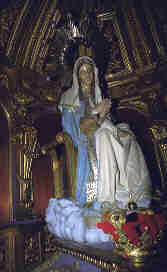 They promised her to raise a church in her honor at the site where Chile's independence is signed: "In the very same place where the battle is waged and victory is won, a sanctuary will be raised to the Virgin of Carmel, Patroness and General of the Chilean armed forces, and the same magistrates who make this vow will lay the foundation in the very same site of her mercy, which will be that of her glory. " That was why in the midst of the battle of Maipú, on April 5, General San Martin encouraged his army with the cry: "Our Patroness, the most Blessed Virgin of Carmel, will give us victory, and right here we will build the church we promised her to commemorate this triumph." Before the end of the year, the first stone of the first sanctuary was laid. The shrine was completed in 1892. The present church was completed in October, 1974. In 1923, at the request of the Chilean bishops, the Holy See proclaimed the Virgin of Carmel principal patroness of all Chileans, not just of the army and navy as she had been until then. There are two Carmel images that Chileans especially venerate; the one at the National Shrine of Maipú, carved in Quito, Ecuador in 1785, and the one, made in France, at the Basilica of the Savior in Santiago de Chile, that was solemnly crowned in 1926. The liturgical feast of Chile's patroness is celebrated on the last Sunday of September. 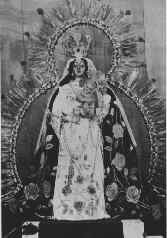 Alonso de Narvaez, a Spanish painter, did a portrait of the Virgin of the Rosary on a rustic cloth woven by Indians. To paint in tempera he used pigments taken from the soil and herb and flower juices of the region. Since the cloth was nearly square (forty-four inches high and fourty-nine inches wide), to fill in the space the artist added next to the Virgin the figures of St. Anthony of Padua and St. Andrew, apostle. These were the patron saints respectively of the Spanish colonist who had commissioned the painting and the monk who had ordered it. In 1562 the portrait was placed in a chapel with a straw roof that leaked, and in a short time the humidity, air and sun, had so damaged the painting that it was impossible to recognize what it was. In 1577 the damaged painting was moved to Chiquinquirá and left abandoned in a room that had formerly been the family oratory. Eight years later, Maria Ramos, a pious woman from Seville, cleaned and straightened out the modest chapel and placed in it the faded canvas that had once had Mary's image. Tradition has it that the prodigy took place on Friday, December 26, 1586. The image which this woman had so desired to contemplate stood out again, having recovered its colors and brightness. The instantaneous process of restoration gradually closed the scratches and holes in the cloth, overlaying them with color and light. The Virgin of the Rosary in the center of the painting is about a meter high; she is looking towards the left as if to call attention to the nearly naked Child in her arms. The image has a serene countenance with a delicate smile which radiates sweetness. Both her face and the Child's are light colored. The Child has a little brightly-colored bird tied to his thumb and a small rosary hangs from his left hand. Our Lady leans over a half moon in a position suggesting that she is about to start walking. A white toque covers her head and her rose colored robe is covered by a sky blue cape. With the little finger of her left hand she holds a rosary which hangs in front of her, and in her right hand she has a queenly scepter. The painting still shows traces of its former damage; the figures seem vague, but at a distance they acquire relief and color. For three hundred years the painting of the Virgin of the Rosary of Chiquinquirá was unprotected, and thousands of pious objects were touched annually against the frail cotton cloth, some times with rods or canes in order to reach it, which should have destroyed it. Since 1897 a thick glass protects the picture from severe weather conditions and the pilgrims' fervent excesses. Pius VII declared Our Lady of Chiquinquirá patroness of Colombia and granted her her own liturgy. 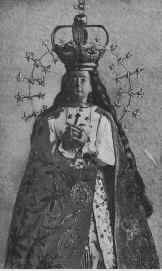 "La Chinita," as her people call her, was canonically crowned in 1915, and in 1927 her sanctuary was declared a Basilica. In the city of Cartago, as in many others during colonial times, whites were segregated from Indians and mestizos. Those who were not absolutely white were not allowed to enter the city, where a stone cross marked the limits. On August 2, 1635, feast of the Holy Angels, a poor mestizo woman called Juana Pereira, in her daily search for firewood discovered a small image of the Virgin simply carved on a dark stone, placed conspicuously by the footpath. Juana happily picked up the treasure, with no idea that she would find it five more times in the same place, because the image kept disappearing from cupboards, chests and even the parish tabernacle, and on each occasion would return to the same rock where it had been found. It was evident to all that the Virgin wanted a center of worship there, where she could comfort the poor and humble. The image of Our Lady of the Angels is very small, only about three inches high. She carries the Child on her left arm, where the cloak that covers her from the face down, is gathered in pleats. She has a round, sweet face, slanted eyes and a delicate mouth; her coloring is leaden, with scattered golden sparkles. Only the faces of Mary and the Child Jesus are visible, as a precious cloak protects and adorns, her. At present the statuette is displayed in a handsome monstrance which surrounds it completely, enlarging its appearance. "La Negrita" (the little black one) as she is affectionately called by the people of Costa Rica, was solemnly crowned in 1926 and in 1935, His Holiness Pope Pius XI declared the beautiful shrine of the Queen of Angels a Basilica. Pilgrims visit Cartago constantly to pay their respects to their heavenly Mother; many enter the shrine on their knees, as an act of humility and gratitude, and then they pray at the rock where the blessed image was found. The stone is wearing away under the constant rubbing of so many pilgrims' hands that caress it gratefully while they pray for relief of their sufferings. There is a spring under the stone and its waters are collected by the faithful who visit the shrine seeking mercy and health. Some time around the year 1600, two native Indians, Rodrigo and Juan de Hoyos, together with a ten-year-old slave boy, Juan Moreno, went out looking for the salt needed to preserve the meat of the Barajagua slaughter house, which supplied the workers and inhabitants of "Santiago del Prado," now known as "El Cobre." That day they were just able to reach Cayo Francés, halfway across the Bay of Nipe, where they encamped to escape the fury of a storm which would have torn their frail canoe to pieces. Calm was restored with daybreak, and they took to the transparent sea. In the distance, they saw a white bundle floating on the waves and approaching them slowly. At first they took it for a sea bird. As it came closer, it seemed to be a girl and at last they were able to determine that it was a statue of the Virgin Mary holding the child on her right arm and with a gold cross in her left hand. The statue was fastened to a board with the inscription, "I am the Virgin of Charity." According to the sworn testimony of witnesses, despite the recent storm and the motion of the waves, neither the figure of the Virgin, nor her clothing, was wet. The head of the statue is of baked clay covered with a polished coat of fine white powder, possibly rice paste, and the recent thorough renovation of the image revealed the fine features which countless paint coatings had deformed. A well-shaped nose and a well-proportioned face with large, loving eyes convey a gentleness that invites trust and prayer. The Virgin is about sixteen inches high and her feet rest on a brilliant moon whose ends surround on both sides the silver cloud where three cherubs spread their golden wings. The Child, at the left side of the statue, raises a hand as if blessing, and in His other hand He holds a gold globe. The entire figure is covered by a heavy cloak which gives it the typical triangular shape. 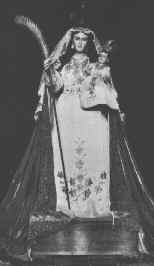 The image's original clothing was white, but the faithful have given her gold and silver colored robes. Because Our Lady of Charity is a symbol of Cuban nationality, popular statues give her a white robe, a blue cloak and have the Child dressed in red: the colors of the Cuban flag. 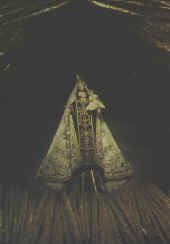 Nowadays the Virgin's dress, a copy of a very early one, is of heavy lamé with gold threads, and has the national Cuban shield embroidered on the skirt. The simple folk have gotten used to the image of their "Cachita" with the small boat at her feet and in it the "Three Juans" who found her floating on the water. This detail is omitted in the oldest reproductions which copied the original statue. At the request of the veterans of the War of Independence, Our Lady of Charity was declared the patroness of Cuba by Benedict XV in 1916 and solemnly crowned in the Eucharistic Congress held in Santiago de Cuba in 1936. Pope Paul VI raised her sanctuary to the category of Basilica in 1977. Dominican Republic: Our Lady of "La Altagracia"
The Dominican Republic, where the evangelization of the New World began, is under the protection of the Virgin under two titles: Our Lady of Mercy, the principal patroness who was so proclaimed in 1616 during the Spanish colonial rule, and the Virgin of Altagracia, Protector and Queen of the hearts of the Dominicans. "Tatica from Higuey," as the natives of Quisqueya fondly refer to her, has her story and legend. 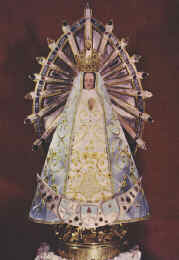 There are historic documents that prove that in 1502, in the island of Santo Domingo, the Most Blessed Virgin was honored under the title of our Lady of la Altagracia, whose portrait had been brought from Spain by Alfonso and Antonio Trejo, brothers who were among the first European settlers of the island. When the brothers moved to the city of Higuey, they took the image with them. Later they offered it to the parish church so that everyone could venerate it. The first shrine was completed in 1572, and in 1971 the present Basilica was consecrated. Back at Higuey, the merchant decided to stay overnight at a friend's house. After dinner, feeling sorry for his daughter's disappointment when he should arrive empty-handed, he described to those present his unsuccessful search. As he spoke, an old man with a long beard, who was passing by, took out of his knapsack a rolled up painting and gave it to the merchant saying, "This is what you are looking for." It was the Virgin of Altagracia. At day break the old man had disappeared. The portrait of Our Lady of Altagracia is thirty-three centimeters wide by forty-five high. Expert opinion has it that it is a primitive work of the Spanish school, painted towards the end of the fifteenth or beginning of the sixteenth century. The painting, which depicts a Nativity scene, was restored successfully in Spain in 1978, and its original beauty and color can now be appreciated. The rigor of time, candles' smoke and rubbing by the hands of the devotees had so altered the surface of the portrait that it had become nearly unrecognizable. The scene of Jesus' birth is painted on a fine cloth. The Virgin, lovely and serene, occupies the center of the picture; she is looking with tenderness at the child who lies nearly naked on the straw of the manger. 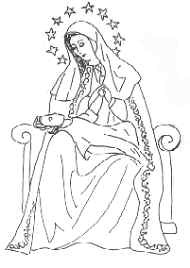 A blue cloak sprinkled with stars envelops her and a white scapular closes her garments in front. Maria of Altagracia wears the colors of the Dominican flag; anticipating in this manner the national identity. A radiant crown and twelve stars frame her head which now has a crown on it. The frame which holds the painting is probably the most refined example of Dominican gold work. This marvel made of gold, precious stones and enamel, is the work of an unknown eighteenth-century artist. Possibly he used the jewels that the Virgin's devotees gratefully offered her. 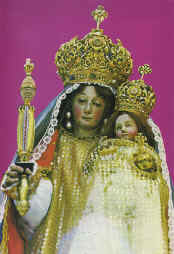 The image of Our Lady of Altagracia had the privilege of being crowned twice: on August 15, 1922 - during the pontificate of Pius XI - and by Pope John Paul II, who on January 25, 1979, during his visit to Santo Domingo, personally crowned the image with a golden silver tiara, his personal gift to the Virgin, the first evangelizer of the Americas. Our Lady of the Presentation of Quinche is a handsome wood sculpture carved in the sixteenth century by Don Diego de Robles, an extraordinary artist who is also credited with other popular and venerated images of Mary. History tells us that those who had ordered the image couldn't or wouldn't pay the sculptor for it, and he traded it to the oyacachi Indians for some large cedar boards he needed. At a later time, popular fancy enriched the facts with the legend that the Virgin had appeared earlier to the Indians in a cave and had promised to deliver them from the dangerous bears which devoured the children. 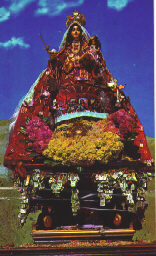 The Indian chiefs were astonished when they saw Diego Robles arrive carrying the image of the Virgin, whom they recognized as having the same features as the Lady who had appeared to them in the cave and had spoken to them. The statue remained under the care of the Indians fifteen years, when the bishop of the place ordered it moved to the village of Quinche from which it finally took its name in 1604. The image is a fine carving in cedarwood, measuring sixty-two centimeters in height. The handsome sculpture is hidden by large brocade garments, covered with jewels and embroidered with gold and silver threads, which only allow the serene dark face to be seen. The Virgin holds a scepter in her right hand and with the left hand she holds the Child, who lifts a hand in blessing and in the other hand displays a gold globe crowned with a cross. The pedestal at her feet and the large half moon, both of pure silver, and the heavy crowns made of gold and precious stones which adorn the heads of Jesus and Mary, evidence the generosity of the people of Ecuador who like to see their patroness resplendent, dressed with the best finery. The face of the Child Jesus has features resembling those of the mestizo children of those mountains. Mestizo is also the color of the mother, synthesis of the Inca and Spanish souls. She has a delicate oval face with a slender nose, thin lips and a small mouth; her slanted eyes and her sad gaze with half closed eyelids give her a unique gentleness. This is why she is so popular in Ecuador, specially among the Indians who affectionately refer to their protector in heaven as "La Pequehita" (the little one). There are an amazing number of songs in honor of the Virgin of Quinche, in "Quechua," "Jibaro," and many other dialects of the region as well as in Spanish; many have been sung for three hundred and even four hundred years. The image was crowned in 1943 and her feast is celebrated each year on November 21. The present shrine was declared a National Sanctuary in 1985. Tradition has it that some time in 1682 some merchants found an abandoned box on the shore of Salvador's Mar del Sur. They were unable to open the box. As it was tightly closed and sealed, they surmised that it contained something of value, and decided to take it to the city of San Miguel where they would find out how to open it. They tied the box on a donkey's back and undertook the long and dangerous journey to the city where they arrived on November 21, meaning to inform the local authorities of their find. But when they went by the parish church, now a cathedral, the donkey lay down on the ground. They were then able to open the box and were surprised to find that it contained a lovely image of Our Lady holding the Child. The origin of this image is still a mystery as it never was known for whom the box was intended, or how it came to reach the beaches of El Salvador. It is said that a hard and bloody struggle was going on between the inhabitants of the region, but when they heard of the marvelous discovery in the abandoned box, they put down their weapons and immediately ceased fighting. It is also related that during the 1833 fratricidal struggles, when everyone expected a blood bath, the victorious side—instead of taking reprisals—had the blessed image placed in the atrium of the parish church. At the feet of Our Lady, a solemn vow was made to keep no grudges and to erase all hatred from the hearts so that peace would bring about brotherhood and reconciliation. This is why the image was given the beautiful title of Our Lady of Peace, whose liturgical celebration is held on November 21 in memory of its arrival at San Miguel. The statute is a dressed wood carving; with the national shield of El Salvador embroidered on the front of the image's white robe. The image holds a gold palm leaf in memory of the eruption of the Chaparrastique volcano, which threatened to destroy the city with burning lava. 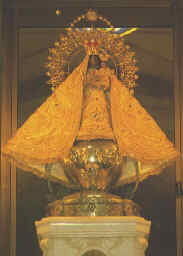 The frightened dwellers of San Miguel brought out the statute of Our Lady of Peace to the principal door of the cathedral, and at that precise moment the force of the lava changed direction, moving away from the city. In the exact place where the lava changed direction there's a town called Milagro de la Paz (Miracle of Peace). On the day this happened, September 21, 1787, everyone saw in the sky, formed by the clouds, a white palm leaf that seemed to sprout from the crater of the volcano. Considering that this was a sign of the Virgin's protection, her faithful decided to place in her hand a gold palm like the one they had seen in the sky. Benedict XV authorized the crowning of the image which took place on November 21, 1921. The goldsmith who made the Virgin's crown used 650 grams of gold and many precious stones, among which was a huge emerald surrounded by diamonds. The new shrine dedicated to Our Lady of Peace was completed in 1953. The image of Our Lady of the Rosary, the work of unknown artists, was finished in 1592. Commissioned by Friar Lopez de Montoya, a Dominican priest, the statue was made completely of pure silver, but her robes and pedestal are not visible, having been covered by elaborate garments and ornaments. Her devotees claim that the coloring of her beautiful face changes from bright pink to a much more faded shade whenever there is a conflict or some national misfortune is imminent. 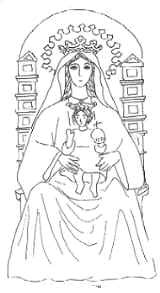 The image has a large rosary in her right hand and with her left one she holds the Child who seems to be trying to free Himself from her embrace. There is a popular tradition that the Virgin Mary went out to travel through America and that the Child fell asleep when they reached Guatemala, which is why she stayed there. In 1821 the leaders of the independence movement proclaimed her Patroness of the new nation, and they took an oath before her image that they would not rest until they freed Guatemala. The Virgin of the Rosary was solemnly declared 'Queen of Guatemala' in 1833 and was crowned canonically on January 26, 1934 in a huge ceremony in the principal plaza of Guatemala in front of the cathedral. The ceremony had to be held in the open because there was no church large enough to hold the multitude that had gathered. The crown which Archbishop Luis Durou placed on the head of the blessed image is a valuable silver jewel with which the people of Guatemala wanted to show their devotion and enthusiasm for their patroness. The artists who made it used one-hundred-and-twenty-one emeralds, forty-four diamonds, eighty pearls, five amethysts, a gold rose, etc. The church and convent of St. Dominic, current shrine of the Virgin of the Rosary, was begun in 1788 and completed in 1808. October, the month dedicated to the rosary, is the most popular and important religious happening for the Guatemalan people and nation. The entire month is occasion for celebration, feasting, and constant pilgrimages to the sanctuary of the Virgin of the Rosary. 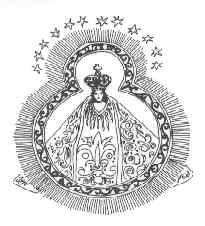 The tiny image of Our Lady of the Conception of Suyapa was found by a humble young peasant on a Saturday in January 1747. Alejandro Colindres, and Lorenzo Martinez, an eight-year-old boy, were returning to the village of Suyapa, tired from working all day gathering corn. They were half way there when night fell as they reached the Piliguin ravine. This seemed to them like a good place to spend the night and they lay down on the hard ground. Right away Alejandro felt that something, apparently a stone, was preventing his finding a comfortable position for his back. In the dark, he picked it up and threw it far away. Strangely enough, on lying down again he felt the same discomfort, but--intrigued--this time he did not throw it, instead he put it away in his knapsack. At day break he discovered that the mysterious object was a charming small image of Our Lady carved in cedar wood. Our Lady of Suyapa measures only six and a half centimeters. It is a very old carving, probably the work done with devotion by an amateur artist. Her angelic looks reflect the nobility of the native race. It is a dark image with an oval face and shoulder length straight hair: her tiny hands are joined together in a prayerful attitude. 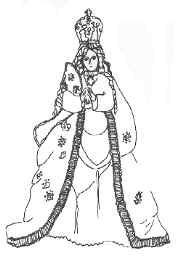 The original painted color of her robe is light pink, which now can be seen slightly, covered by a dark cloak trimmed with golden stars and adorned with valuable jewels. 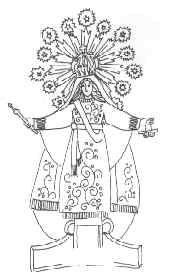 The object of great veneration on the part of the Honduran people, the image rests on a solid silver sphere, and appears surrounded by a circle of silver rays, which evoke 'the woman dressed by the sun' mentioned in the Book of Revelation. In 1925, Pius XI declared Our Lady of Suyapa patroness of the Republic of Honduras, and February 3 was chosen as her feast day with proper Mass and office. The first shrine was blessed in 1780 and the first notable attested miracle, occurred in 1796. The present enormous church, with space for the multitude of pilgrims who visit Suyapa, was visited by John Paul II in 1983. In the land of the poor, this sanctuary of Santa Maria de Suyapa is located in one of the humblest parts of the city. Greatly astonished, the Franciscan bishop of Mexico, Fray Juan de Zumarraga, contemplates the fresh roses of Castille that sprinkle with colors the floor of his episcopal palace. Tears run down his cheeks as he recognizes the beautiful image that has just appeared on the rough cloth that Juan Diego has unfolded in his presence. It is Tuesday, December 12, 1531, scarcely ten years after the conquest of Mexico, and the Mother of God has come to the defeated Indians to "show and give" all her "love and compassion, help and defense, because I am your merciful mother." For four days the Virgin has told her wishes to Juan Diego, talking to him in nahualtl, his own tongue. When she identified herself, Mary used the word coatlallope, a compound noun made up of coatl, that is: serpent, the preposition a, and llope, to crush; in other words, she identified herself as "the one who crushes the serpent." Others reconstruct the name as Tlecuauhtlapcupeuh, which means: "The one who comes from the region of light as the Eagle of Fire." In any event, the nahualtl word sounded to the Spanish friars like Guadalupe, relating the Tepeyac apparition with the beloved title which the conquistadores venerated in the Basilica raised by King Alfonso XI in 1340. The Spanish image of "Guadalupe" is an ancient wood carving dressed in rich brocade cloaks that give it the triangular shape much favored at the time. She is very different from the Tepeyac painting, not only because of her Iberian-Byzantine features, but also because she carries the Child Jesus in her left arm and holds a royal scepter in her right hand, displaying a gold crown on her head. The Guadalupe of Cáceres, whose origin, according to legend, is placed about the sixth century, was found on the shore of the Guadalupe River (hidden river in Arabic) in the Villuercas mountain range, around 1326, after the Moors were driven out of that area. Four hundred years elapsed before western culture recognized with admiration that the image imprinted on the native cloth was truly a Mexica codex, a message from heaven loaded with symbols. Helen Behrens, a North American anthropologist, discovered in 1945 what the eyes of the Indians had "read" in the painting of the "Mother of the true God by whom one lives" in December of 1531. The image of Our Lady of Guadalupe remained stamped on a coarse cloth made from maguey fibers. It was on the ayate used by the Indians to carry things and not on the tilma which is usually of a finer cotton texture. The weft of the ayate is so simple and coarse that one can see through it easily, and the fiber of the maguey is such an unsuitable material that no painter would have chosen it to paint on. The image of Our Lady of Guadalupe is a marvelous cutural synthesis, a masterpiece that presented the new faith in such a way that it was immediately understood and accepted by the Mexican Indians. It is impossible to describe the rich and complex symbolism contained on this painting-codex because every detail of color and of form carries a theological message. The face imprinted in the ayate is that of a young mestizo girl; an ethnic anticipation, since at that time there were no mestizos of that age in Mexico. Mary thus assumes the sorrows of thousands of children, the first of a new race, which at that time was rejected both by the Indians and by the conquerors. The painting which is preserved in the modern Basilica of Tepeyac measures approximately sixty-six by forty-one inches and the image of the Virgin takes up fifty-six inches. The Virgin is standing and her face leans delicately, somewhat reminiscent of the traditional "Immaculates." The blue star sprinkled cloak is the Tilma de Turquesa (turquoise tilma) used by the nobles that denoted the rank and importance of the bearer. Sun rays completely surround the Virgin of Guadalupe as if to indicate that she is their dawn. This young girl is a few months pregnant, as implied by the black bow at her waist, the slight protuberance below it, and the increased intensity of the sun rays at the waist. 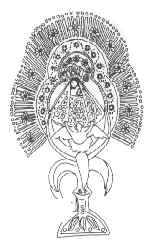 Her foot rests on a black moon (symbol of evil to the Mexica) and the angel, who supports her with a severe gesture, has his eagle wings unfolded. The Virgin of Guadalupe presented herself to her children as the "Mother of the Creator and Preserver of All the Universe," who comes to her people because she wishes to protect all of them, Indians and Spaniards, with the same motherly love. With the wonderful imprint on the ayate a new world was beginning, the dawn of the sixth sun that the Mexicans were awaiting. For 116 years the picture of the Virgin of Guadalupe was exposed to the rigors of the weather, with no protection against dust, humidity, heat, the candles' smoke and the continuous rubbing of thousands and thousands of objects that had been touched to the venerated image, in addition to the constant contact of the hands and kisses of an infinite number of pilgrims. It has been proven that the maguey fabric breaks down easily; cloth woven with this vegetable fiber does not last more than twenty years, and - nevertheless - Juan Diego's ayate has lasted over four centuries in perfect condition. Pius X proclaimed Our Lady of Guadalupe "Patroness of all Latin America"; Pius XI of "all the Americas"; Pius XII called her "Empress of the Americas"; and John XXIII "The celestial missionary of the New World" and "the Mother of the Americas." Every year twenty million faithful approach the venerated picture to express their affection and veneration to their heavenly Mother. 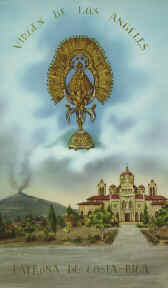 It is estimated that on her feast day, December 12, nearly three million people go to the Sanctuary of Tepeyac, whose round shape symbolizes the tent that sheltered the Ark of the Covenant in its march through the desert; the inside lamps which hang from the ceiling are reminiscent of the cloud that led the people of God day by day, and the shining gold wall that supports the picture represents the column of fire and light that indicated the way during the night. In this great basilica John Paul II beatified the Indian Juan Diego on May 6, 1990. There have been serious attempts against the picture and it has withstood corrosive acids and even a large bomb without suffering damage. Now a thick strong glass protects it inside the air-conditioned room which is closed like a strong box. The faithful can look at the picture from a moving mat which slides in two directions so the devotees will not remain in ecstasy contemplating their beloved Virgin. The marvels in connection with the Virgin of Guadalupe have interested today's scientists, who have been unable to determine both the origin of the pigments that give color to the picture and how it was painted. The images reflected in the eyes of the Virgin of Guadalupe have been studied since 1929. At present, thanks to modern techniques, it has been possible to discover in both eyes groups of people and objects placed in accordance with the most precise optical laws; just as in the eyes of a live person. It is as if the "painter" of the picture had wanted to reproduce inside the eyes of the image the scene that these were seeing at the time. The Virgin of Guadalupe is deep in the hearts of her people; she gave Juan Diego a delicate treatment of nobility elevating prophetically the condition of all her people. Because of this she was the banner raised by Father Miguel Hidalgo to begin the revolution for Mexican Independence. The small village of "El Viejo" clustered around a Franciscan mission of the early colonial period, is very near the Pacific coast. The Sanctuary of Our Lady under the title of the Immaculate Conception of El Viejo, is located in this village of far western Nicaragua. Although there is no historic evidence of it, it is said that the image, which has been venerated there since the sixteenth century, was brought to America by a relative of St. Therese of Avila, whose last name was Cepeda. Some have even maintained that it was the saint's brother, Rodrigo de Cepeda Ahumada, but there is no proof of this. Tradition holds that St. Therese of Jesus gave this image to her relative, who took it with him everywhere. He arrived with it in Central America, landing at "Realejo," which was then the most important port of Nicaragua. Soon he moved to the Franciscan mission in search of a healthier climate. A room in his house became an oratory, where the neighbors went attracted by the beautiful expression of the Immaculate Virgin's face. 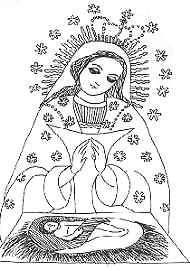 When Cepeda received orders to transfer to Peru, he tried to take the image of the Immaculata with him, but the move kept getting postponed time and time again because of bad weather; until he realized it was God's will that he give up his beloved image and leave it among the people who had learned to love her so quickly. The Virgin remained forever in Nicaragua. The image of Our Lady of the Immaculate Conception of El Viejo is a handsome woodcarving measuring approximately thirty-three inches. She is, dressed in beautiful robes which are changed often. Her sweet face is dark colored, and she is looking down modestly. Her hands are folded on her breast as if interceding for her children. The carving is kept in a silver reliquary which safeguards her and is usually veiled by a curtain that is opened when the faithful gather to venerate her. There is a unique feature of the devotion to Our Lady of El Viejo: the sanctuary has a valuable collection of silver objects of different kinds, given to the image in gratitude for favors received. Each year, on December 6, these objects are taken out to the public plaza where the people congregate to clean and polish all the silver pieces; this is an annual event and not a single valuable article of the Virgin's treasure has ever been lost. This popular ceremony is known as "The Washing of the Silver." For Nicaraguans, devotion to the Immaculate Conception is something cherished and deeply rooted. The traditional image of the Immaculate is always present in Catholic homes and churches, and the December 8 feast is a national event. On the eve of December 8, the famous Griterla (shouting) takes place. The families put up splendid altars in the homes that can be seen from outside. The people look inside shouting: "Who is the cause of our joy?" and the residents of the house respond, "Mary's Conception," then the visitors are treated to sweets and typical foods. It is the occasion for great festivities nationwide, with music, singing and dancing while waiting for the coming of the feast day of the patroness of the people of Nicaragua. Although the Church has not proclaimed the Immaculate Conception officially as the Patroness of the Republic of Panama, her feast day has been declared a national holiday. Every December 8 is a feast day in Panama to celebrate the solemnity of the Immaculate Conception of Mary, which coincides with the traditional "Mothers' Day." The Panamanian people have chosen several Marian titles to express their love of the Mother of God. Nuestra Señora de la Antigua is a canvas of the Virgin's Assumption whose veneration dates from before 1691. This painting is venerated by the faithful in the temple of Chirivi in Tunja, a very popular shrine located near the Turine River. The portrait, nearly two meters high and eighty centimeters wide, represents the Virgin with the child in her arms. Both figures have gold-plated silver imperial crowns superimposed. The feast of Our Lady of la Antigua is celebrated on the third Sunday of January. In a much visited small chapel in Panama City, the painting of "Our Lady of Mercy" is venerated. It is a painting of the Virgin, half-length, brought to Panama in the seventeenth century. It is said that when the pirate Henry Morgan attacked and set fire to the city in 1671, the painting remained intact although most of the city was destroyed. There are other important devotions: La Virgen Hallada (The Virgin Found), a stone sculpture of Our Lady of Mount Carmel which is venerated in Montijo; "Our Lady of Tarivá," a 1571 painting that convokes her faithful in the village of that name; "Our Lady of Sopetrán," another famous painting enjoying great devotion, whose worship in the village of Hita dates from 1615; the image of "Our Lady of Hool" and the "Virgin of Penonomé" are also honored in other regions of the Panamanian isthmus. In the early Sixteenth century, a guarani converted Indian of the Franciscan mission of Tobati, is in danger of death. He is surrounded by the fierce mbayáes, a tribe which has refused to accept the Christian faith and has declared itself an all-out enemy of the converts. In the forest thickness a massive tree trunk provides safe refuge. He hides there, cringing and trembling; he asks for protection from his Mother in Heaven, the Immaculate that the good friars have taught him to love. There he promises the Virgin that if he survives, he will carve a pretty image with the wood of the protective trunk. Nobody saw him, his persecutors went by without discovering his presence, and as soon as he could the Indian sculptor went back and took from the tree the wood he needed for his work. Two images came out of the trunk; the larger one went to the church of Tobati, and the Indian kept the smaller one for his personal devotion. Years later the great flood that created the Lake of Ypacaray threatened to destroy the nearby towns, and the Franciscan friars, accompanied by the inhabitants of the region, organized public prayers pleading for the calming of the waters. It is related that Father Luis de Bolaños blessed the waters and was recognised as the one the Indian had carved years earlier, and which from then on was called La Virgen de los Milagros (the Virgin of Miracles). Our Lady of Caacupé is a handsome wood carving with a delicate oval face and blue eyes; like the lmmaculate she joins her hands on her breast in prayer and her blond hair falls to her shoulders. The small image measures some 50 centimeters. For a time, in order to give her more prominence and cover her with rich garments, her figure was enlarged disproportionately, until Church authorities decreed that the image be given its original size. The Virgin of the Miracles wears an elegant white tunic and has a beautiful sky blue cloak over her shoulders, both embroidered with gold thread. The image stands on a sphere resting on a large half moon. Mary's feet seem to step on a serpent, an allusion to Genesis and Apocalyptic texts. Construction of the present church began in 1945, and although it has not been completed yet, it has been the sanctuary of the Virgin of the Miracles of Caacupé since 1980. Caacupé is the religious center of Paraguay: the meeting place of the nation and the Church, because this blessed image has accompanied the formation process of the Paraguayan nationality. Every eighth of December, the great feast of "Maria de Caacupé," thousands of pilgrims congregate at the Virgin's sanctuary; they come walking, on bicycles or however they can, to show their love and gratitude to their Mother, the "Virgen Azul de Paraguay (the Blue Virgin of Paraguay)." Devotion to the Virgin of Mercy dates back to the time of the founding of Lima. It is known that the Mercederian friars, who came to Peru with the conquerors, had already built their primitive convent chapel around 1535. This chapel served as Lima's first parish until the construction of the Main Church in 1540. The Mercederians not only evangelized the region, but they also participated in the city's development, building beautiful churches that have been preserved as a valuable cultural and religious patrimony. With these friars came their celestial patroness, the Virgin of Mercy, a Marian title of the thirteenth century. Tradition has it that around 1218, St. Peter Nolasco and James I, King of Aragon and Catalonia, experienced separately a vision of the Most Holy Virgin who asked them to found a religious order dedicated to rescuing the many Christian captives held by the Moslems. This Order of Our Lady of Mercy, approved as a military order in 1235 by Pope Gregory IX, was able to liberate thousands of Christian prisoners, and later became dedicated to teaching and social work. The Mercederian friars' habit imitates the garments worn by the Virgin when she appeared to the founder of the order. 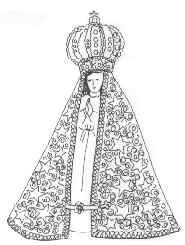 The image of the Virgin of Mercy is dressed all in white: over her long tunic she wears a scapular with the shield of the order imprinted breast high. A cloak covers her shoulders and her long hair is veiled by a fine lace mantilla. Some images have her standing, with the child in her arms, and others with her arms extended showing a royal scepter in her right hand and in the left some open chains, a symbol of liberation. Such is the appearance of the beautiful image venerated in the Basilica of Mercy in the capital of Peru. It was enthroned at the beginning of the seventeenth century and has been considered the patroness of the capital. In 1730 she was proclaimed "Patroness of the Peruvian Lands" and in 1823 "Patroness of the Armies of the Republic." On the first centennial of the nation's independence, the image was solemnly crowned and received the title of "Grand Marshall of Peru," on September 24, 1921, Feast of Our Lady of Mercy, since then declared a national holiday, when every year the army renders homage to her high military rank. The image carries numerous decorations granted by the Republic of Peru, its governors and national institutions. 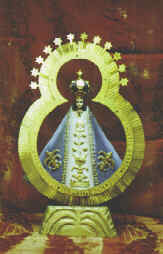 In 1970 the town council of Lima gave her the "Keys of the City," and in 1971 the president of the Republic conferred on her the Great Peruvian Cross of Naval Merit, gestures which evidence the affection and devotion of Peru to Our Lady of Mercy, that many consider their national patroness. The Sanctuary of Our Lady of Chapi? It was our intent to offer the most prominent and where possible the official Marian patronages of major Latin American countries on The Mary Page. We are aware that there are thousands of minor Marian shrines. The Marian Library has books in our holdings which deal with these many shrines and miraculous images. They could be consulted. It would be too time consuming to put these all on the web page. However, we are glad to make information available and were recently asked about Our Lady of Chapi in Peru. The Sanctuary of Our Lady of Chapi is southwest of Arequipa, Peru. It originated among the Indio population. In 1884 the statue was transferred from a willow tree to a rustic chapel. A Mercedarian missionary built a church (finished in 1897) and promoted pilgrimages from Arequipa. The sanctuary is frequently called the "Little Lourdes" because of a great number of miraculous healings. The name and worship of Our Lady of the Divine Providence originated in Italy in the thirteenth century. It was a very popular devotion which later passed to Spain, where a shrine was built in Tarragona, Catalonia. When Gil Esteve Tomas, a Catalan, was named bishop of Puerto Rico, he brought with him this devotion which he had become acquainted with during his seminary years. The bishop had to place his diocese in the hands of Divine Providence, for he found the cathedral nearly in ruins and the finances of the diocese in similar condition. The bishop's trust and work bore fruit quickly; in less than five years the cathedral church had been restored, and immediately worship of the Virgin of Providence was established there. The original image, venerated by the Servants of Mary, and other Italian religious orders and saints, was a beautiful oil painting in which the Virgin is shown with the Divine Child sleeping peacefully in her arms. The title "Of Divine Providence" has been attributed to St. Philip Benicio, fifth superior of the Servants of Mary. On a day when his friars had nothing to eat, having invoked the help of the Virgin, he found, at the door of the convent, two baskets full of food whose origin could not be found. The image that Don Gil Esteve ordered was carved in Barcelona according to the prevailing taste. It is a handsome seated figure, made to be dressed, and it was in the cathedral sixty-seven years, until 1920 when it was replaced by a magnificent all wood carving, which is the image of Our Lady of Divine Providence most familiar and best known to the Puerto Rican communities. Mary leans over the Child, who in an attitude of complete trust sleeps peacefully on her lap. The Virgin's hands are folded in prayer while she gently supports her Son's left hand. The whole carving suggests tenderness, abandonment, devotion and peace. Pope Paul VI, by a decree signed on November 19, 1969, declared Our Lady Mother of Divine Providence principal patroness of the island of Puerto Rico. In this document it was also decreed that the Virgin's solemnity be transferred from January 2 to November 19, the day that the island was discovered. The intention was to join together the two great loves of the Puerto Ricans: love of their gorgeous island and love for the Mother of God. The oldest carving, which dates from 1853, was the one chosen to be solemnly crowned during the meeting of the Latin American Bishops Council (CELAM), that took place in San Juan de Puerto Rico on November 5, 1976. On the eve of this event, the image was vilely burnt in the Parish of Little St. Therese in Santurce. And in this condition, the image was crowned amid the emotion and tears of thousands of her children and in the presence of cardinals, archbishops and bishops from all Latin America. The burnt statue was sent to Spain to be restored and is presently awaiting the construction of the projected grand national santuary, where it will be placed. 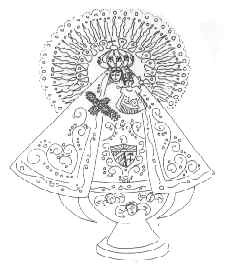 The small image of the Virgin of the Thirty Three is a wood carving originating in the missions that the Jesuits had in Paraguay in mid eighteenth century. The image was made in one of the Guarani workshops that flourished in these famous missions. Around 1779 the image was placed in the chapel that the Jesuits looked after in the village of Pintado and later, when the entire village moved to what is now the city of Florida, the residents took with them the beloved image before which their ancestors had prayed. On April 19, 1825, thirty-three orientals, Uruguayan patriots, landed on the beaches of the Agraciada to commence the liberation of their country. When they reached Florida, they went to the small church and placed the future of the new nation at the feet of the Virgin. National Independence is proclaimed on August 25, and the members of the Constitutional Court having signed the Act of Independence, presented themselves again before the image and placed their nascent country under her protection. 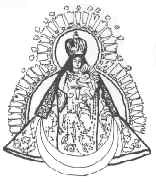 Ever since, the natives have called this image La Virgen de los Treinta y Tres (The Virgin of the Thirty Three). On August 25, 1975, on the 150th anniversary of its independence, the Uruguayan nation officially declared this image of the Virgin and the church where it was venerated "Historic Monuments." The Virgin of the Thirty Three is thirty-six centimeters high. It is a baroque carving of the Assumption of the Virgin, whose cloak and robes seem to move becasue of their many pleats. Since 1857, "The Liberator of Uruguay" has a gold crown with precious stones, a gift of the second leader of the Thirty Three, who later became president of the Republic. The disproportionate size of this crown - an extraordinary gold work - has become the distinctive feature of this Marian image. 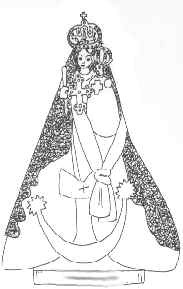 The image was crowned canonically in 1961 by a concession of His Holiness John XXIII, who the following year proclaimed her officially "Patroness of Uruguay." The solemnity of "Our Lady of the Thirty Three" is celebrated on the second Sunday of November with a pilgrimage to her shrine from every part of the nation. When the Spaniards arrived at the region of Guanare, around 1591, a group of Indians of the Coromoto tribe decided to abandon their land and flee towards the Tucupido River, since they did not want to have anything to do with the white men or with the religion they brought with them. Fifty years later, still not having converted to the Gospel, the Indians live in a small village not far from the Spaniards' town. Both groups live in peace, but remain isolated from each other. Such was the state of affiars when on a morning of the year 1651, the chief of the Coromotos and his wife watch an extraordinary vision: in the ravine of the Tucupido River, upon the waters, a beautiful lady is looking at them with a loving expression on her face; the small child she carries also smiles amiably. The mysterious lady summons the Indian chief and orders him: "Leave the forest with your people and go to the white men in order to receive the water on the head so as to be able to enter heaven." Impressed by what he has seen and heard, the chief decides to obey the beautiful lady and leaves with his tribe to be schooled in the Christian religion. But the Indian, used to the freedom of the forests, cannot become accustomed to the new way of life and he returns to his village with his family. The lady appears again, this time at the Indian's humble hut. Although the Virgin presents herself surrounded by a luminous aura whose rays fill the hut with fire, she does not succeed in moving the chief, who, annoyed, tries to throw her out and even takes his weapons in hand with the intention of threatening the inopportune lady. Smiling all the way, the Virgin approaches the chief gently and when he stretches out his hand angrily to catch her, she disappears before his eyes. A small holy card, where the image of the Lady was printed, was left in the Coromoto Indian's closed fist. The Virgin of Coromoto is a tiny relic that measures twenty-seven milimeters high and twenty-two wide. The holy card's material could be parchment or tissue paper. The Virgin is painted seated, and on her lap sits the Child Jesus. It seems to have been drawn with a fine pen, sketched as a portrait done in India ink with dots and dashes. The Virgin and Child are looking straight ahead; their heads erect with royal crowns upon them. The back of the throne which supports them has two columns joined together by an arch. The Virgin's shoulders are covered by a crimson cloak with dark purple reflections, and a white veil falls symmetrically over her hair. She wears a straw colored tunic and the Child a white one. The image is kept inside a richly adorned monstrance where it is presented for the veneration of the faithful. At the request of the nation's bishops, on October 7, 1944 Pius XII declared her "Patroness of the Republic of Venezuela" and her canonical coronation was celebrated on the third centenary of her apparition, on September 11, 1952. His Eminence Cardinal Manuel Arteaga Betancourt, Archbishop of Havana, representing Pope Pius XII, crowned the sacred image of Our Lady of Coromoto. The Venezuelans celebrate their patroness each year on three different occasions: on February 2 and September 8 and 11. The National Sanctuary of the Virgin of Coromoto, meeting place of great pilgrimages, was declared a Basilica by Pope Pius XII on May 24, 1949. P. Julio Joao Brustolini. Aparecida: Sua Imagen, Seu Santuario. Aparecida 1980. Mons. Alberto Aramayo. Breve Historia de la Virgen de Copacabana. Editorial Don Bosco, 1983. Fr. Julio Maria Elia. Copacauana-Copacabana. Santuario de Copacabana, Bolivia, 1981. José Luis Guerrero. Flor y canto del nacimiento de Mexica, Librería Parroquial de Clavería, Mexico 1990. Joan Carroll Cruz. Miraculous Images of Our Lady. Tan Books and Publishers, Inc. Rockford, Illinois 61105, 1993. María Eloísa Alvarez del Real. Santuarios de la Virgen María Apariciones y Advocaciones. Editorial América, S.A. Panamá, 1990. Alberto Villaverde S.J. 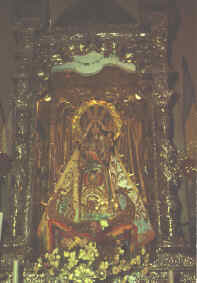 Santa María Virgen de la Caridad del Cobre. Editorial Pueblirín, Puerto Rico 1994. Mario Vizcaíno Sch.P. 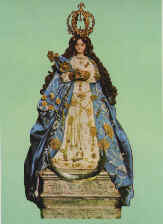 La Virgen de la Caridad Patrona de Cuba. Sepi, Miami, 1981. Dr. Carlos Sono. Historia de la Imagen y del Santuario del Quinche. Imprenta del Clero. Ecuador 1883. Mons. Agustin Román. La devoción a la Virgen en el mundo hispano. Miami, 1983. Rogelio Zelada-Agustín Román. Las Imágenes de Jesús y María en Hispanoamérica Instituto de Liturgia Hispana de los Estados Unidos. The International Marian Research Institute has been given permission to transmit the Marian Titles on the web from issue 5, February 2, 1996. SOUTHEAST DOCUMENTATIONS / DOCUMENTACIONES SURESTE is an instrument for personal and community reflection, to help awaken and deepen values and commitments by individual reading, comments, and group discussions.